Marc talks about what happened on this day in history, including the day the Dominican Republic declared itself independent from Haiti, the day the 19th Amendment giving women the right to vote was held up as constitutional, and the birthday of opera singer Marian Anderson. This is Marc Steiner, and today is February the 27th. That’s “Here We Go Again” by Ray Charles featuring Norah Jones. Ray Charles was sometimes called “The Genius,” and this song was on the album “Genius Loves Company,” which went Number 1 on the U.S. Album Chart today in 2005. Ray Charles died in 2004. And all the legacies of colonialism, slavery and race came crashing down on the island we knew as Hispaniola, that tiny space with Haiti on one side and the Dominican Republic on the other. This is the day the Dominican Republic declared its full autonomy from Haiti. The Spanish and the French long battled over this island. Fewer people of African descent lived in what is now the Dominican Republic, and the French — to keep the new Haitian government off-balance — supplied Spanish-speaking Dominicans the weapons to fight Haiti, in an island that had been united under Haiti for 22 years. And today in 1844, at the close of the Dominican=Haitian Wars or the Dominican Independence War, the Dominican Republic declared itself independent from Haiti, though the war continued from 1844-1856. The ethnic, racial, cultural and political divide between these two peoples and nations remains deep to this day. On this cold South Dakota day in 1973, more than 200 members from the Lakota Nation and the American Indian Movement, known as AIM, seized the town of Wounded Knee. It was a sacred ground, being the site of the 1890 Wounded Knee massacre where 167 unarmed Native men, women and children were gunned down by the 7th Cavalry. This takeover by AIM decades later was fueled in part by the corrupt, violent Indian reservation government. And it was also to force America to pay attention to conditions in Native communities and the oppression they lived under. Indians, many of whom were Vietnam Veterans, held Wounded Knee in an armed and sometimes violent confrontation with the United State’s government for 71 days. In 1922, by a unanimous vote, the Supreme Court found that the 19th Amendment, giving women the vote, was indeed constitutional. The right of women to vote (as well as the right of women to engage in many other activities) was declared constitutional It took over seventy years of fighting and petitioning on a national scale, starting with the Seneca Falls Convention, to make this women’s suffrage legislation a reality. Women and men both were advocating equal rights for women as far back as in the early 19th Century. Charlotte Ray was the first African American woman lawyer in the United States. Born in New York in 1850 and graduated from Howard Law School today in 1872 becoming the first Black woman lawyer in the United States . Her father was a minister and leading abolitionist, and Charlotte Ray went on to open her own law office. She advertised her services through newspaper Frederick Douglass’s newspaper. She broke ground not just as a Black woman but as a woman, being the first woman to be admitted to the DC and to the the privilege of arguing before the Supreme COurt. , eventually she was driven of the world of law of the discrimination she faced as both an African American and a woman. She became a teacher and was deeply t involved in the movement for women’s suffrage. Charlotte Ray set the precedent for women who were aspiring lawyers, to be admitted into their states’ bars. 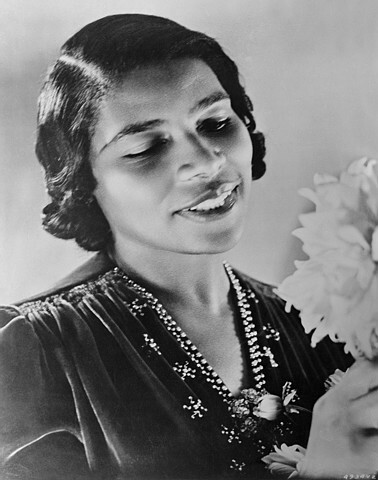 It’s the birthday of another important woman: Marian Anderson., born in 1897 in Philadelphia. Because of poverty and race she was not able to attend a high school or pay for music lessons. but would sing in her community and tried to learn as much as she could from those around her. Eventually, the pastor of her church and community members raised the money for Marian Anderson to attend South Philadelphia High School and to begin singing lessons. She was denied entry into the Philadelphia Music Academy, an all-white institution that rejected her because she was Black. She continued singing and impressed all of those she met in the music industry, but had to go to Europe to perform and become a star.. In 1939 the Daughters of the American Revolutions refused to allow her to sing in Constitution Hall then First Lady Eleanor Roosevelt organized an Easter Sunday concert on the National Mall with Marian Anderson headlining. America had a new star of opera and music. Happy Birthday Marian Anderson. It’s also the birthday of journalist Charlayne Hunter-Gault, born today in Due West, South Carolina in 1942. The first Black student at the University of Georgia, Charlayne Hunter also became the first Black reporter at the Louisville Times and the New Yorker Magazine. Continuing to break barriers, she also became the first Black woman correspondent on a daily news program, working as a foreign correspondent for National Public Radio and reporting for the Public Broadcasting Service. Here’s a song to think about on February 27th. It features a young singer-songwriter who we lost today. At the age of 12, he heard a doo-wop group perform at a school talent show, and went on to be the leader of a group with four other young boys. They called themselves The Teenagers. And the lead singer of that group was the young Frankie Lymon. In 1968, at the age of 25 on this day, he died of a heroin overdose. We remember him today with the song “Baby Baby” performed by Frankie Lymon and the Teenagers.